This is extremely important. The whole idea of boondocking is traveling out to a completely desolate location with very few people present if any. The last thing you need to ruin your trip is to get stuck in the middle of nowhere with a dead battery or a flat tire and no spare. This seems like a small step but could end up saving you a lot of headache down the road. How many times have you left for a trip when the sun was shining and there wasn’t a cloud in the sky only to be hit with a torrential downpour just a few hours later? Know what the weather is going to be like so you can pack accordingly. There won’t be any stores around to buy a poncho or a sweatshirt where you’re going! 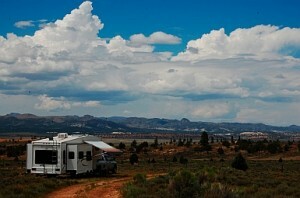 Do your due diligence before leaving on your boondocking trip. It’s probably not a great idea to drive aimlessly until you find that “perfect” location. Chances are, you won’t find what you’re looking for an ending up staying at a campground you’ve been to before. Talk to your RV buddies and other people you know who enjoy camping first. There are tons of resources online to get information on where the best boondocking spots are around the country. Do yourself a favor and learn from the mistakes of others. Here’s a good place to get you started. If it hasn’t become evident enough by this point, we want to make sure you plan accordingly before taking a boondocking trip in your RV! Load up on lots of water and preferably non-perishable food items to bring along with you. If you plan on being out in the wild for an extended period of time, you’ll need to make sure that your food won’t go bad. You may want to consider making a few things to bring along with you before leaving on this adventure. May we recommend Alton Brown’s granola recipe? Looks like we just did! There won’t be any power hookups when you’re boondocking so it’s important to invest a few dollars into a sufficient generator to make sure you have power in your RV. A 3000-watt generator will run you $250 – $500 depending on the brand, if it’s new or used, etc. Just don’t expect to be running your A/C unit and your microwave at the same time. Don’t leave trash and food around your campsite at night, or during the day for that matter. When you’re boondocking, there aren’t people to warn you of bear sightings near your setup. Unfortunately, you’ll have to figure that part out for yourself and we highly doubt that’s something you’d be looking forward to. 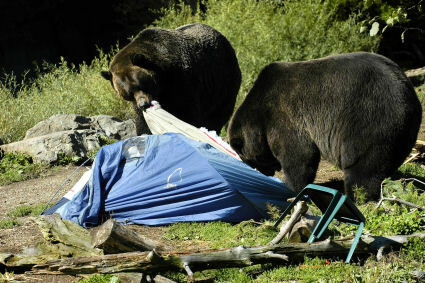 Bears will absolutely ruin your campsite! What’s the one thing we all wish we had more of in our camper? That’s right…space! And if there’s one place in particular that always seems to be lacking the appropriate amount of room for all of our belongings it’s the…kitchen! Right again! Let’s take a look at a few tips that will help you save space in your RV kitchen and make your next cooking and/or kitchen cleaning experience that much better. Each trip you take is different…whether it’s the length of time, destination, time of year, etc. So with that in mind, make sure to plan out your meals ahead of time so you know exactly which kitchen gadgets you’ll need to bring with you. No need to lug that stand mixer along every time you hit the road. Knowing exactly what you need to bring before you leave will help cut down on the clutter and free up some well needed space in the kitchen. Spend a couple bucks on a good Tupperware or Rubbermaid plastic container set. Don’t get any ideas about using all of the mismatched containers you have flooding your kitchen cabinets at home, either! You need to have a uniform set so when they’re not being used, they all fit inside each other and minimize the amount of room they take up in your cabinets. The nice thing about these types of storage containers is that they don’t have to be limited to just storing food. They can easily be used to stash pens, tape, screws, nails, you name it. Time to start getting creative if you want to save space. This partially goes back to planning properly, but don’t bring every pot and pan you own on every trip because you “just might need it”. Chances are you won’t need that 10-gallon pot while you’re at the beach for the weekend. One recommendation would be to purchase a double burner griddle pan. 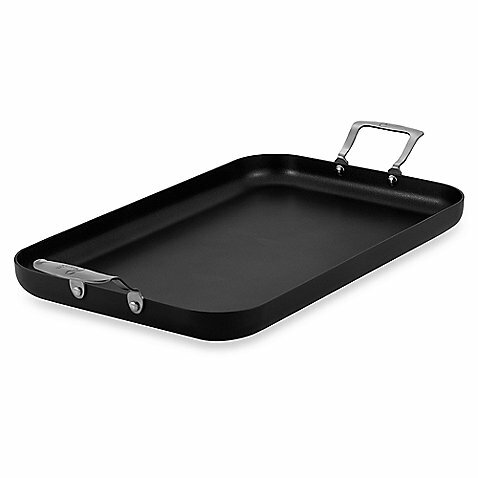 These pans are awesome because you can cook multiple meals in one shot, only have to clean one item, and they are super thin and easy to store. Every RV chef should become best friends with the crockpot. Don’t spend your whole evening slaving in the (tiny) kitchen, rather throw some ingredients in the crockpot in the morning and go out and enjoy the day. By the time you get home you’ll have a delicious, hot meal ready to go(Check out our Pinterest board on camping recipes and look for “Big List of Easy Crockpot Recipes” to get you started). 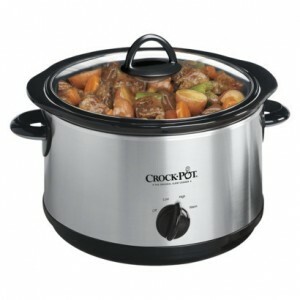 Depending on how large your family is you can buy either a large or small crock. Once again, only one dish to clean. Leftovers? No problem, throw them in one of your new plastic containers and keep it moving! These tips should be enough to get you going in keeping the clutter to a minimum in your RV kitchen and maximizing the little space you do have. You’d be surprised what a few small changes can do to give your camper a much larger feel!